Every once in a while dating a nerd introduces you to something that turns out to be AWESOME! Because of dating my nerd I have recently discovered something, I’m basically an archery master. I’m not saying I could compete with Robin Hood but I think I have a little bit of natural talent. It all started at the Renaissance Faire, which believe me there will be a post on later. 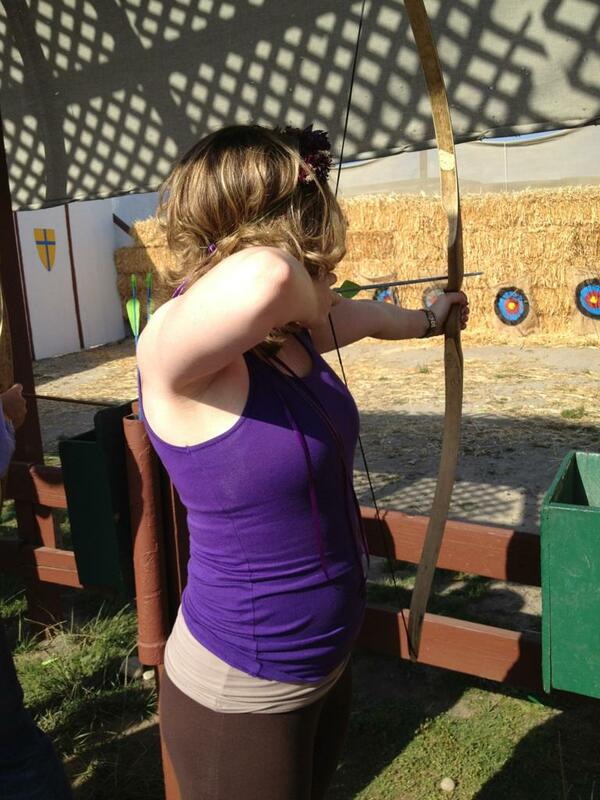 I was pretty much convinced that going to the Renaissance Faire meant the end of being “normal” as I knew it, that is until I discovered I could channel my inner Katniss at the archery range. Check out my awesome form in the picture above (and yes I’m wearing a wreath). I have always had a small obsession with Robin Hood (side note I’m partial to the BBC Robin Hood or the Disney version) and this was my opportunity to live out my dream. 10 arrows later and I’m hooked and I wasn’t half bad. After that Cyclops and I decided archery should become our new hobby so we sought out some local ranges. We ended up checking out Woodley Park Archery Range where you can go on any Saturday morning and take a free beginner’s class. They help you choose your bow, give you some great tips & training and then they set you loose and you can shoot until your fingers are numb. Definitely someone I urge you to go and check out at your local archery range. So far it hasn’t become our new hobby (I suspect that has something to do with how early you need to wake up on a Saturday morning to make it) but I totally want to go to some more ranges in the LA area and keep honing my sweet Archery skills. Then I can document for all you readers my rise to archery glory. Look out Brazil 2016! You Voted and Now It’s Official. What Comic Will I Be Reading? Stop Right There! Are You Talking to a Nerd?